The Tattersall’s Tiara is the final Group 1 race of the Queensland Winter Racing Carnival and runs on a Saturday in late June at Brisbane’s Eagle Farm Racecourse. Formerly called the Winter Stakes, the Tattersall’s Tiara is open to fillies and mares only and is a weight-for-age event run over 1400m. The race offers a total of $500,000 in prize money including $320,000 to the Tattersall’s Tiara winner and connections. A number of earlier races offer a ballot exemption to the winner/s into the Tattersall’s Tiara field including New Zealand’s Thoroughbred Breeders Stakes. In Brisbane the lead-up events that have a Tattersall’s Tiara ballot exemption up for grabs in are the Kingsford-Smith Cup, Doomben 10,000, Dane Ripper Stakes, QTC Cup, Queensland Guineas and the state’s richest race the Stradbroke Handicap. The Stradbroke Handicap – Tattersall’s Tiara double was last achieved by Srikandi (2015) when the latter was run as a one-off at the Gold Coast Racecourse. The last horse to complete the Dane Ripper Stakes – Tattersall’s Tiara double was Cosmic Endeavour (2014). The latest edition of the Tatt’s Tiara runs on Saturday June 22, 2019. The Tatt’s Tiara betting markets are usually dominated by fillies and mares coming off a win in one of the traditional lead-up races. The leading preparatory race for fillies and mares heading into the Group 1 is the Group 2 Dane Ripper Stakes (1400m), which runs two weeks prior at the same track. From 2009 – 2017 the Dane Ripper Stakes produced five Tattersall’s Tiara winners including Red Tracer (2013) and Cosmic Endeavour (2014) who both completed the double. Favourites have a decent recent record in the Tattersall’s Tiara with four saluting in the past decade, most recently Srikandi (2015), while both Miss Cover Girl ($21 in 2016) and Tycoon Tara ($19 in 2017) scored notable upsets. 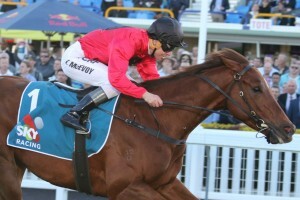 The latest Tattersall’s Tiara 2019 betting odds are available right as market open up on Ladbrokes.com.au. The Tattersall’s Tiara field draws the season’s best fillies and mares traditionally coming off a Brisbane lead-up campaign. The largest fields in recent years were 20 runners in 2007 – 09. The smallest Tattersall’s Tiara field since 1996 was 12 runners when Melito won from the outside barrier. Tattersall’s Tiara nominations close the Monday of race week with final acceptances revealing the field released on the Wednesday before the race runs on the Saturday. Srikandi (2015) was the last mare to complete the Stradbroke Handicap – Tattersall’s Tiara double. Photo Credit: Daniel Costello. The official Tattersall’s Tiara 2019 field of final acceptors has now been released by Racing Queensland as of Wednesday June 20, 2018 and will be published below along with the confirmed jockeys. Early Tattersall’s Tiara 2019 Nominations close the Monday leading-up to Tattersall’s Tiara Day, which is the last major event of the Queensland Winter Racing Carnival, and will be provided in full below. The Tattersall’s Tiara form guide lists for punters all the crucial pre-betting information like the jockeys, trainers, barriers and lead-up runs of the female sprinters in the field. Wide barriers in the Tattersall’s Tiara have produced plenty of success with four of the eight winners from 2010 – 2017 jumping from a double digit gate including Srikandi (15 of 15 in 2015) and Red Tracer (16 of 16 in 2013). Runners trained outside of Brisbane have dominated the race in recent history, so looking at the interstate runners with a lead-up run in Queensland is essential when doing the Tattersall’s Tiara form. Also look for a win last time out on the form guide as the four Tattersall’s Tiara winners from 2012 – 17 won their lead-up races in Brisbane. Tattersall’s Tiara tips include looking for in-form fillies and mares coming off a win, graduates that finished in the money in the Dane Ripper Stakes two weeks before and backing the favourite. The three-year-old fillies have a dominant record over the older mares in the race with five of the 10 winners from 2008 – 2017 winning in their three-year-old season, so taking the fillies in the field is another good Tattersall’s Tiara betting tip. Our Ladbrokes’ exclusive Tattersall’s Tiara 2019 betting tips and trifecta selections on the Group 1 weight-for-age fillies’ and mares’ race at the end of the Brisbane winter racing season will be detailed below the week of the race so, stay tuned for those to back and sack this season. The Tattersall’s Tiara results have been dominated by last-start winners and three-year-old fillies in recent years. While the favourites have a solid strike rate, upsets are not uncommon with notable recent upsets scored by Tycoon Tara ($19 in 2017), Miss Cover Girl ($21 in 2016), Pear Tart ($15 in 2012), Yosei ($15 in 2011) and Russeting ($10 in 2009). Noteworthy Tattersall’s Tiara winners from the past decade include Cosmic Endeavour (2014), Melito (2010) and looking further back Dane Ripper (1997). The official Tattersall’s Tiara 2019 Results & Finishing Order will be available below once the Group 1 Brisbane race is run and won on Saturday June 22, 2019.